Today (Saturday, 21 Nov. 2009) I visited Thatekad and adjoining forest patches with Jaime Chithra. We were a bit late to reach the Cuckoo Paradise at eight in the morning. Though we could not see any Cuckoos first we heard the welcome call of Indian Cuckoo. A couple of Red-wattled Lapwings were warming up in the open grassland in bright sunshine. The Cuckoo that we finally saw there turned out to be a Drongo Cuckoo! Plenty of Spotted Doves and Pompadour Green Pigeons were on the canopies of the teak tress. Racket tailed, Bronzed, Ashy and Black Drongos were also vocal and very much visible in the morning glory. As we crossed the river Periyar the Ashy Wood Swallows were sitting tight together on the electric wires above water. As soon as we entered the Salim Ali Sanctuary with guide Rejiv the Jazzy ensemble of Malabar Grey Hornbills began. We saw the Brown Hawk Owls perched on the pinnacle of a bamboo grove. 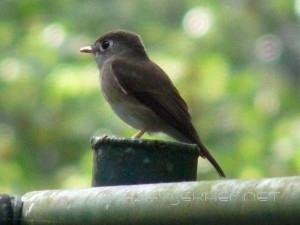 Brown-breasted and Asian Brown flycatchers came to us to say hi! Black-naped and Black-hooded Orioles were enjoying themselves on top of bare branches in the sun. Little Cormorants and White-throated Kingfishers were plenty in the lagoons nearby. A solitary Small Blue Kingfisher was perched on a pole provided by the authorities anew. 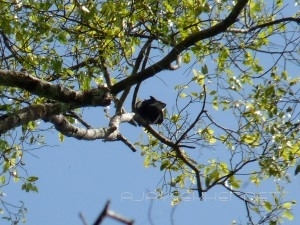 Inside the forest we saw the awesome Black Baza spreading its wings and crest and coming down to perch on a tall tree. 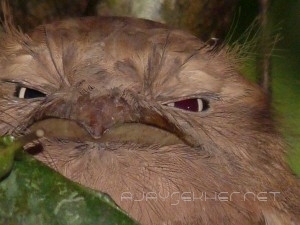 We were shown the roosting Frogmouth, the favourite of Thatekad. A Crested Serpent Eagle was hovering above with frequent calls. We saw a lot of Brahmany Starlings and Black Crested Bulbuls. Yellow-browed Bulbuls were also not uncommon. A few Paradise Flycatchers also came out. Gold-fronted Leafbirds were delightful to watch. Scarlet Minivets showed off in full colours to entertain. As we were leaving the place we also heard the call of a Dollar Bird distinctly. From Thatekad we went further west all along the Periyar to reach Budhathan Kettu barrage were a Long-tailed Shrike was sitting on a pole awaiting us. Popular superstition says that the huge stone dam was built by the ‘Bhuthathans’ or Demons, but historians say that it was built by the Bhudhist missionaries to feed paddy fields in the adjacent villages in the pre-Brahmanic era. Then we moved further down stream along the southern bank of Periyar to reach Thrikariyur an ancient Buddhist shrine which is now a Hindu temple. The huge temple pond and the Pearl-spots or Karimeens in it are a reminiscence of the old eco-cultural heritage of conservation, a lasting legacy of Buddhism in Kerala and South India in general. A few Indian Cormorants and a Darter were seen by the pond. From here we moved slightly south west to reach Kallil, the ancient Jain rock-cut temple near Methala in Odakali. We were received by a chatty group of jungle babblers on this rocky hillock. It is a laterite hillock with a granite top. 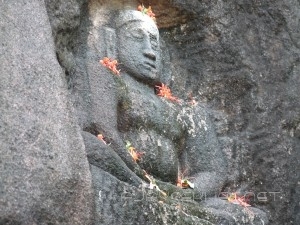 The image of the Thirthankara is still visible above the rock entrance. Archeologists say that there were reliefs and granite idols of Mahavira, Parshwanatha and Padmavathi Devi inside the rock chamber. Now the Padmavathi Devi idol is worshiped as Bhagavati. As we encircled the gigantic rocks on top of the shrine we saw the carved image of an elephent on a rock which clearly is a Jain Mudra or symbol of peaceful co-existence with nature without conflict and non-violence. On a nearby ancient fig tree we saw five yellow footed green pigeons savoring the sun and the mellowing fig-fruits. The brooding presence of a Brahmany Kite was really alarming as a dramatic re-enactment of the whole history of violence. Fortunately the green doves were perfectly camouflaged. Then we moved further west to reach Iringol Kavu near Perumbavur. It was already past noon and was getting hotter and hotter. We could not see much birds here except a hasting Oriental Honey Buzzard. Plenty of flower peckers and sun-birds are thriving inside this ancient Sramana sacred grove which was once part of the Periyar valley civilization created and nurtured by the Jain-Buddhist heritage of Kerala. As the clouds of North Eastern Monsoon began to gather in the horizon we were speeding up the retreat back to Kottayam. This entry was posted in Cultural Politics, Culture and Ecology, Eco Watch and tagged Bhuthathanketttu, Birding the Periyar Banks, black baza, Buddhist and Jain cultural hisotry of Kerala, Buddhist and Jain legacy of Periyar valley, flycatchers, frogmouth, Iringol Kavu, Kallil, orioles, owls, Periyar, Periyar Valley civilization, Sraman tradition of Kerala, Thatekad, Thrikariyur on November 22, 2009 by Ajay.